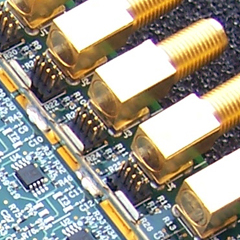 The digital up/down converter products feature software programmable tuners that perform frequency translation and bandwidth reduction to achieve the desired signal characteristics. The hardware incorporates a rich set of software programmable features that include selectable operating modes (continuous, snapshot, periodic), external or timed event triggers, timestamped data samples, data sizing, and data packing. Data is sent to the host computer as a continuous stream of samples or in data packets defined by the VITA 49 specification. Multiple products share a common code base with different analog-to-digital and digital-to-analog converter options for specific market needs. The analog interfaces can be either AC or DC coupled. The AC coupled configuration supports direct IF sampling (bandpass sampling) beyond the first Nyquist zone. The DC coupled option allows operating frequencies to approach zero without attenuation.